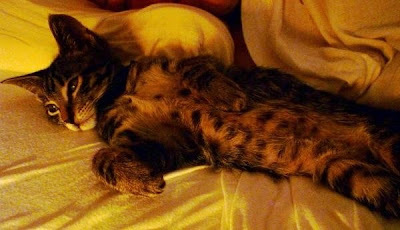 Kate and Oli: Meet My Leopard Belly Mew! So, you probably know that I am Kate. Of Kate and Oli. But do you know who Oli is? I thought it was time to give credit where credit was due (we all know our pets keep us sane) so here's a fun bio all about my little monkey mew, Oliver. I grew up in a house with lots of cats and dogs and when I moved out, I missed them a ton – even though I saw them almost daily and lived a quarter mile away. There’s nothing like falling asleep with a pet :) So, I asked and I asked and I asked my roommate/landlord/best friend Jonathan. After a year and a half, he surprised me with a trip to the SPCA to pick out a kitty!! We ended up choosing the very best kitty ever and proceeded to take millions of pictures of this teeny tiny kitty. Oliver is the most talkative cat I have ever known. He started talking when we brought him home and never stopped. He talks if you look at him, walk into the room, walk out of the room, or even think about him. He talks in his sleep, he talks when he’s happy, angry, hungry! We have conversations with him, me by saying, “Oh really? That’s interesting,” in between his meows, Jon by trying to match his meows, which just makes him meow louder and more insistently. The first picture is him as a baby mew while we were doing a photo shoot and playing with a long fabric toy. This shot was so cute we made it our Christmas card since it looked like he had a scarf on! 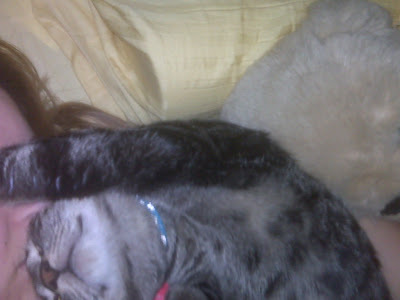 This is Oliver in bed with me – you can see he’s a little bigger, but still a baby mew. He has the most amazing coloring – with stripes on his back and spots on his belly. 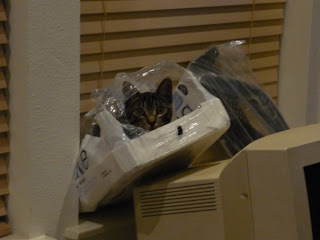 This is Oliver in his rocket ship, aka the empty water bottle package on top of a monitor we were going to donate to charity. We ended up leaving those two items by the door there for months because Oliver was so happy with his rocket ship. Jon and I often wonder what we did before to pass the time, because so much of our time now is spent just watching him and laughing. 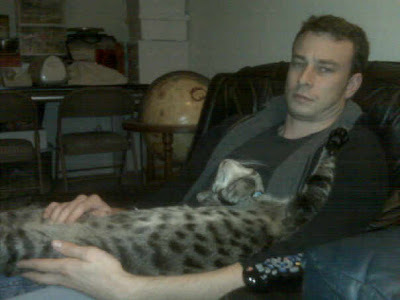 The fourth shot is of Oliver in one of his favorite places – Jon’s lap. 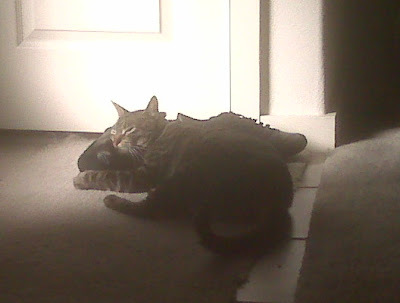 He’s my cat, I feed him and clean his box, but oh how he loves Jon! 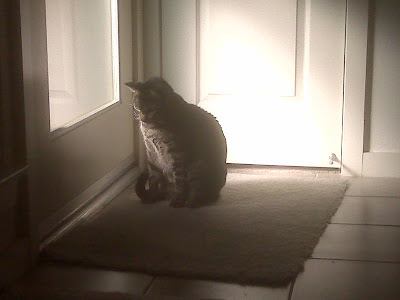 He runs to the door and waits anxiously when he hears the garage open. As soon as Jon walks in, he walks around his feet, meowing over and over until I yell to Jon, “Just touch him, already!” The second Jon sits in his chair, Oliver jumps into his lap and curls up or stretches out, it doesn’t matter as long as he’s on Jon’s lap. This is the mew in bed with me. He likes to sleep in the crook of your arm and if he's not touching your face in some way, he's unhappy. A few weeks ago, I was home sick and I got to see what Oliver does all day. Which apparently is this. This last shot is of Jon and the mew pretty recently. As you can see, Oliver is a HUGE cat. He is really tall and really long and while he does have some flub, he’s also just a BIG cat. He’s extra cuddly this way anyway! 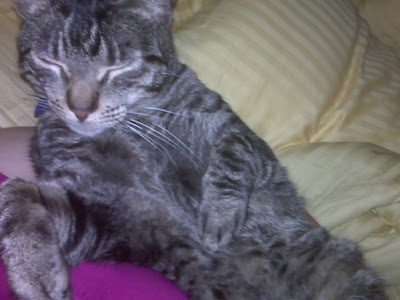 :) You can see, he’s still pretty spotty and still very cuddly and still the best mew ever in general. love tabbies! Oliver is so cute! super cute! love the photo of him staring at the floor, beautiful colors. Haha....that photo of him looking at the floor seriously made me giggle. Love it!